I love my job. Let me start with saying that. I get to create spaces for people that they will use for many years to come. Most of my time is spent designing kitchen spaces. And as with any industry, it’s safe to say, you get what you pay for. I always feel good when we sell one of our cabinet lines here; I know the companies building these cabinets have spent millions of dollars perfecting their art. But you always have that client every so often that comes in & price shops you against the “local custom guy”. Now believe me, being from a small town & working in a small town, I completely appreciate wanting to support your local business. In fact, if those people that support local business didn’t exist, neither would the business I work for. However, sometimes I feel that perhaps people are misinformed about a few things regarding cabinetry. I think there is a belief out there that manufactured cabinetry means the cabinets are sitting there ready to go. Nothing is custom about them. Perhaps a robot assembles them? The truth is, there are many levels to manufactured cabinetry. Yes, there are “stock” cabinet lines. Stock cabinet lines have cabinets only available in 3” increments, have a limited amount of skus available and a limited amount of door styles and finishes available. These cabinets are ready to roll, and should be available to you within a 3 week time frame. These cabinets tend to have a great price point, but don’t allow a lot of flexibility to maximize the use of your space to its fullest potential. These cabinets are a great option for rental units. Your local big box store may even have some of the cabinets in stock ready to go- you may have unfinished wood options or even ready to assemble MDF options. Price point: $ But this is not the only facet of manufactured cabinetry. The local custom guy falls somewhere between the semi-custom & fully custom cabinet lines as far as construction & cabinet skus, but the finish typically falls somewhere between the stock & semi-stock lines. Price point would be about a $$.5, somewhere between semi stock & semi-custom. Lead times have a huge variance depending on the shop. I’ve seen them kicked out as soon as 4 weeks & take as long as 6 months depending on the work load. A benefit of working with your local shop would be that if something were to come up, you personally know the guy or gal that will fix it, and hopefully you can depend on them fixing it in a timely matter. But if you are working with a good local business using a reputable manufactured cabinet line, they will take care of any issues that may come up as well. You just won’t be able to put a face to the person that made the correction for you. The local custom guy has been a tempting thing for us to pursue… we realize their price points are typically lower than the lines we use. But we’ve also done our research. And the research has shown the finish doesn’t hold up. You can’t compete with a finish that has been baked on like it is at these higher end cabinet factories. We’ve had so many people come in and ask if we know someone who will refinish their “local custom guy” cabinets. The cabinet boxes are still in good shape, but the finish is very worn. This happens around the 10 year mark and you will especially notice in high use areas like the sink base or garbage can pullout cabinets. I can’t imagine how disappointing this must be to the homeowner. I’ve seen cabinets from the lines we sell up to 30 years later, and with proper upkeep, the finish looks as good as the day the cabinets were put in. To us, that is priceless. 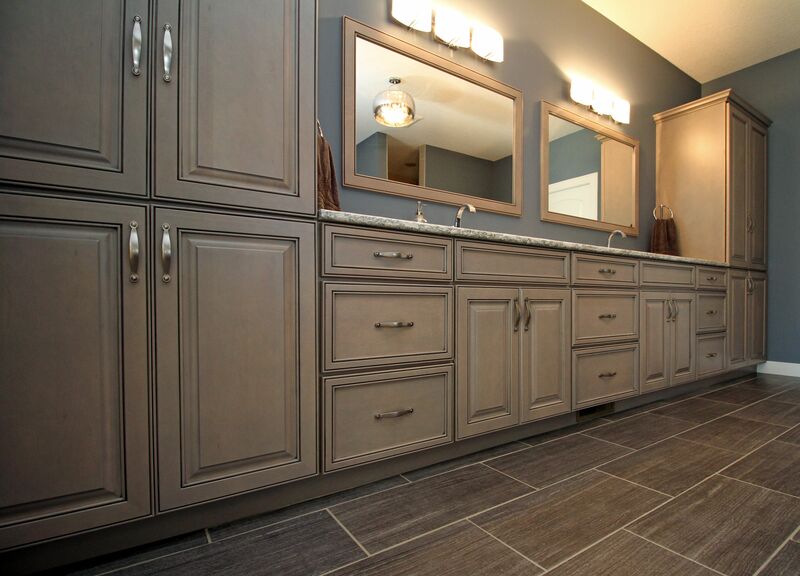 We know people expect more than 10 years out of their cabinetry. I guess the moral of the story is, do your research. The local custom guy may be less expensive than the bid you got on manufactured cabinets, and in the long run, the cabinet boxes will typically go head to head as far as construction goes, but the finish on a semi-custom to full custom cabinet line is unbeatable. How long do you plan on living with your cabinets?